The Florida Gators 2017 spring sports season has been underway for quite a bit now, and unfortunately, OnlyGators.com has not done a great job keeping up with the ins and outs of these teams to this point. That changes now. Let’s take a closer look at the highs and lows for some of the most popular teams on campus at this early point in their seasons. Unanimously ranked a top-five team at the start of the season, Florida has started out 7-2 with seven home wins and a pair of surprising road losses. The first defeat came in the fourth game of the season when Jacksonville took down UF 3-2. The Gators squandered a solid performance by sophomore right-handed pitcher Michael Byrne (7.0 IP, 7 H, 8 K) in the bottom of the ninth by giving up three runs in the game’s final frame. Then on Wednesday, UCF blasted Florida 11-2 as Byrne got absolutely lit up in his start (3.0 IP, 3 ER, 5 R, 6 H, 3 K) and freshman RHP Nick Long did even worse in relief (2.0 IP, 5 ER, 6 H, BB, K). Outside of those losses, the Gators swept William & Mary in their season-opening series and did the same to Miami, outscoring their in-state rivals 9-2 with back-to-back shutouts (1-0, 2-0) to open the three-game homestand. Sophomore RHP Brady Singer (2-0, 0.71 ERA, ER, 8 H, 6 BB, 17 K) has been most impressive in his two starts, while Florida’s hitting has yet to show true signs of life with only four batters eclipsing a .273 average to this point. Florida plays eight of its next nine games at home, including the opener with Florida State on Tuesday, March 14, before SEC play begins. At 17-1 and on a nine-game winning streak, the Gators have shut out eight of their last nine opponents, outscoring those teams 64-1. Florida is currently in the middle of the Judi Garman Classic in Fullerton, California, and it still has games against Cal, UCLA and Northwestern this week before it gets a week off prior to SEC play beginning next Saturday. Let’s talk pitching dominance. 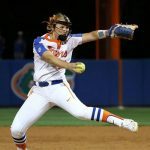 Senior left-handed pitcher Delanie Gourley (5.0 IP, 12 K) retired all 15 batters in a tremendous perfect game on Thursday that marked the 12th shutout in 18 games for Florida this season. The Gators have also registered seven one-hit shutouts (two by Gourley, three by sophomore RHP Kelly Barnhill and one combo effort) and outscored opponents 121-12 overall. As evidenced by the run differential, UF has more than just pitching. Sophomore outfielder Amanda Lorenz (.327) has smashed four homers for 14 RBIs, while freshman third baseman Jaimie Hoover (.366) has a team-high 24 RBIs and is slugging .683. Seven Gators have double-digit run totals already, and two are hitting above .450 despite each having more than 40 at bats. Aside from a tough defeat at top-10 ranked Alabama back on Feb. 3, Florida has taken down the rest of its competition with a 7-1 record and two meets remaining until the SEC Championships on March 18. The Gators also have three perfect 10 event scores on the season already with junior all-around Alex McMurtry hitting the mark on uneven bars and floor exercise, with junior AA Kennedy Baker joining her with a 10 in the latter event. Florida actually played two national team exhibitions as part of its lead up to the season, falling by one point (20-19) to the United States before routing Scotland (27-1) a month later. In between, the Gators suffered their only loss of the young season, a 13-10 defeat at home against No. 1 North Carolina. Florida has since beat No. 3 USC 15-10 and Jacksonville 21-14. Six of its next eight opponents are ranked as the season is just getting into a groove. The Gators fell below .500 at 15-16 when they were knocked out of the SEC Tournament in second-round action on Thursday via a 19-point defeat at the hands of Texas A&M. Florida lost four of six games to close the season and previously dropped five straight in January, including an 82-49 drubbing at the hands of top-five ranked Mississippi State. Part of the reason for the Gators’ struggles has been the early season departure of sophomore guard Eleanna Christinaki, who quit the team after being handed a half-game suspension by head coach Amanda Butler over a “violation of team culture.” She was the team’s leading scorer at 17.6 points per game and chose to leave the program rather than sit out 20 minutes of action. Butler has recruited well in her tenure at UF but seen a number of key players transfer over the last few years. After a 13-17 season in 2014-15, Butler refreshed her coaching staff and went 22-9 with an NCAA Tournament berth a year ago. But it looks like things are now back to normal for the Gators, which may very well signal the end for Butler, a former Florida player. Women: On an early roll as usual, Florida has opened the 2017 campaign 9-0 with seven wins against ranked opponents and only two of those matches in the comfort of home. The Gators have been off since Feb. 19, when they extended their home winning streak to an incredible 163 matches, and begin SEC play on Friday. Men: Following a nice 6-0 start to the season, including wins over top-10 teams USC and UCLA, the Gators have lost four of their last five matches — all against top-16 ranked opponents. 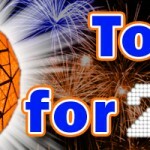 Florida stands at 7-4 as SEC play begins Friday. Men: In a tremendous performance back in February, Florida captured its fifth straight SEC Championship, scoring 1,271.5 points to remain second in league history with 38 conference titles for a single program (Kentucky basketball, 47). The Gators won SEC titles in nine races with Caeleb Dressel, who competed for the United States in the 2016 Rio Olympics, winning seven including individual honors in the 50 freestyle, 100 fly and 100 freestyle. Women: A rough season included a seventh-place finish at the SEC Championships and no individual titles. Men: Ranked No. 1 entering the event, Florida finished tied for third at the SEC Indoor Championships, picking up four individual event championships. Women: Finished eighth at the SEC Indoors. Please continue covering the “minor” sports. You do a better job than the other Gator magazines. The combined talent found in spring teams outweighs football and basketball athletes. Florida has the best all-round spring sports program even taking into consideration Standford (boasting equestrian and water polo). The Gator women’s tennis team has the longest running win streak of ANY NCAA team. Mouse is by far the best all ’round track and field coach in the US right now. Look around, you will find many jewels on which to report.